Please read the following instructions, attentive. The handling of the app is very simple, thus it won’t unnecessarily distract you while driving. Please note: a 100%-security is impossible and thus there is none. The fixed speed camera database covers for more than 99% of Europe. 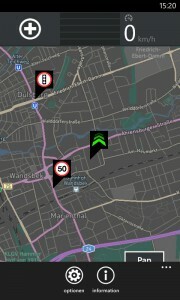 Daily, we receive more than 20.000 reports of speed cameras. 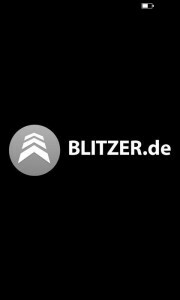 By tapping on the alert („+“) button, it is possible to report mobile or fixed speed cameras and that will actively helping us to improve the quality and quantity of speed camera database. 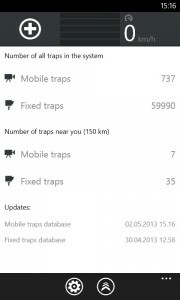 For using our app we recommend a data flat rate. If the online mode is activated, the fixed speed cameras database gets updated every 7 days, mobile speed cameras database will be updated every 5 minutes. 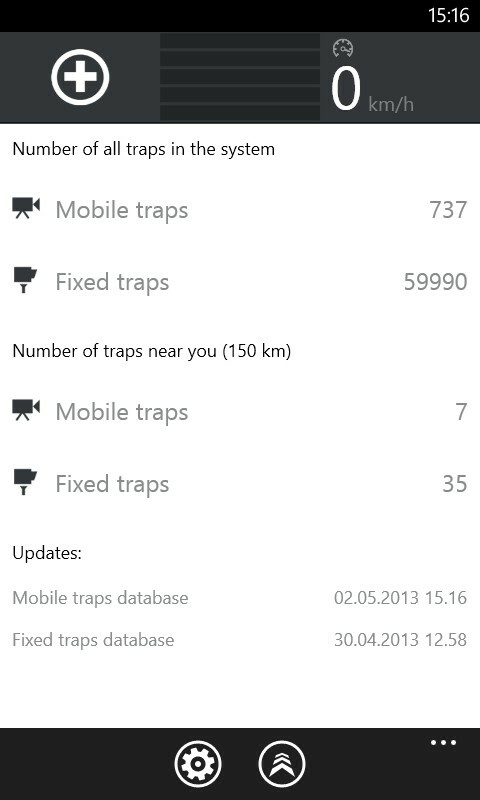 When database updates as been occurred successfully you see a little pop-up on the display. We do highly recommend the using of an in-car charger. The battery will drain more quickly, because the smart phones constantly locate the current position, process received data and also the display is illuminated continuously (should be). 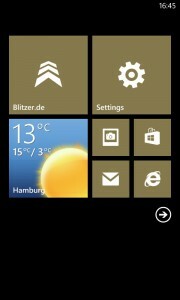 The app runs ONLY on smart phones with Windows Phone 8. Windows Phone 7, 7.5 and 7.8 are not supported. 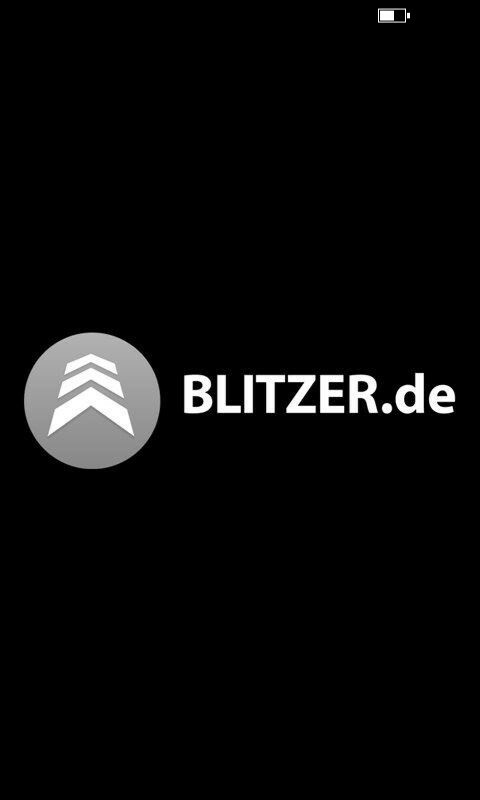 For further questions please visit our website http://portal.blitzer.de to section „Frequently Asked Questions“ or write an email towards info@blitzer.de. As all applications Blitzer.de starts by tapping on the icon. 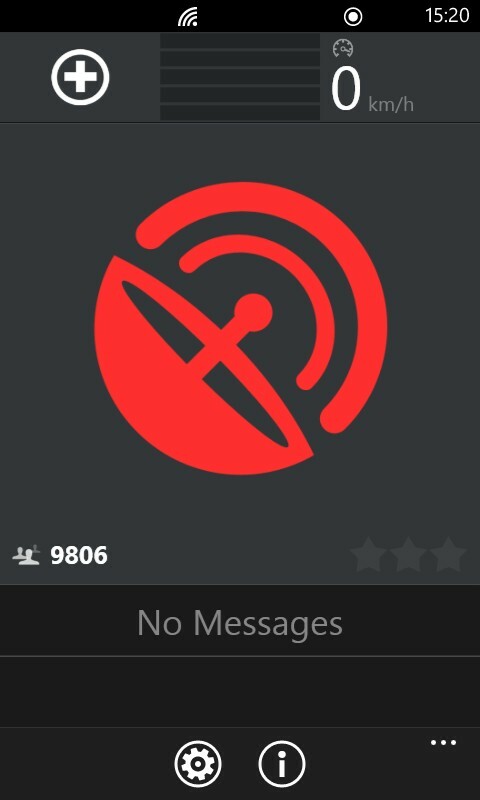 While the app is loading, a black screen with an enlarged icon and our logo are shown. As long as the „+“- button is still dark, speed cameras can‘t get reported. The reporting of fixed or mobile speed camera is feasible after a few seconds moving. 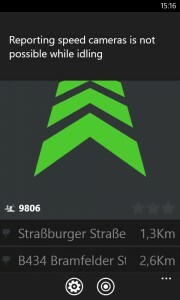 When GPS is receivable and there is no warning for the surrounding area, the screen will show three green chevrons indicating free road ahead. Beneath the green chevrons appears „No messages“. 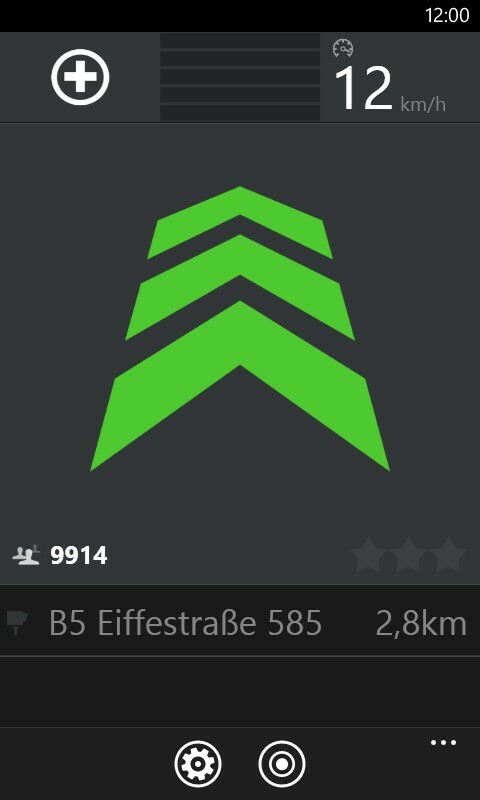 When a speed camera in the direction of travel comes closer than 5 km, beneath the 3 green chevrons appears the street name, where the speed camera is located. The appearance of one or two street names prefixed with the leading symbol for a fixed or mobile speed camera and distance information are the first indicators for speed cameras in the direction of travel. When a fixed or mobile speed camera comes closer than 1,000 meters, the three chevrons change to the symbol for the speed camera type and the indicator bars turn into green. The orange arrow indicates the viewing direction to the speed camera. 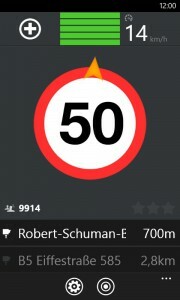 If the current speed is above 80 kph, the first audible alert appears. If the vehicle’s speed is 80 kph or less, the first audible alert appears 500 meters before the speed camera. If shortly after the upcoming speed camera another one ahead less than 5 km away, its street name will be displayed in the bottom line. 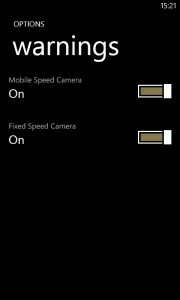 The warnings of fixed or mobile speed cameras are distinguished only by the word „mobile“ in the warning symbol. 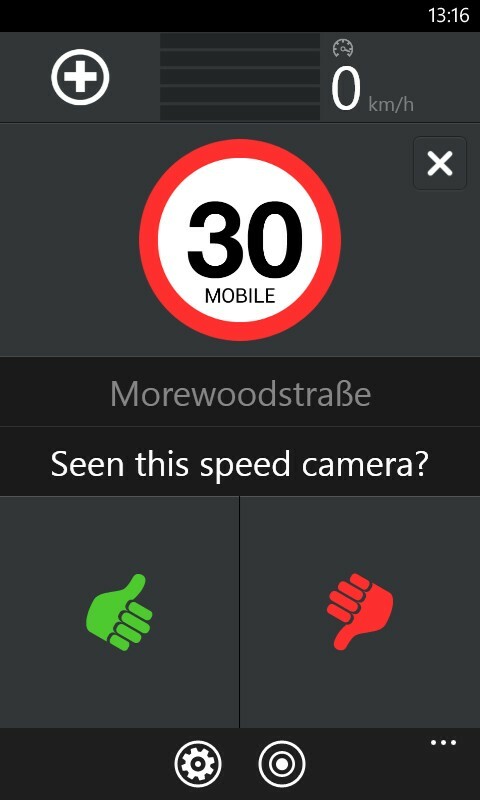 In case of a mobile speed camera in addition to the warning sign up to three stars appear downright. 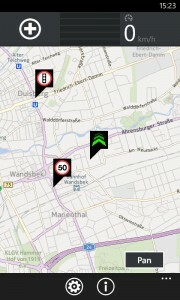 They indicate the quality of warning: the more the stars, the more users have confirmed that speed camera. A speed camera that just has been reported can’t have any stars. 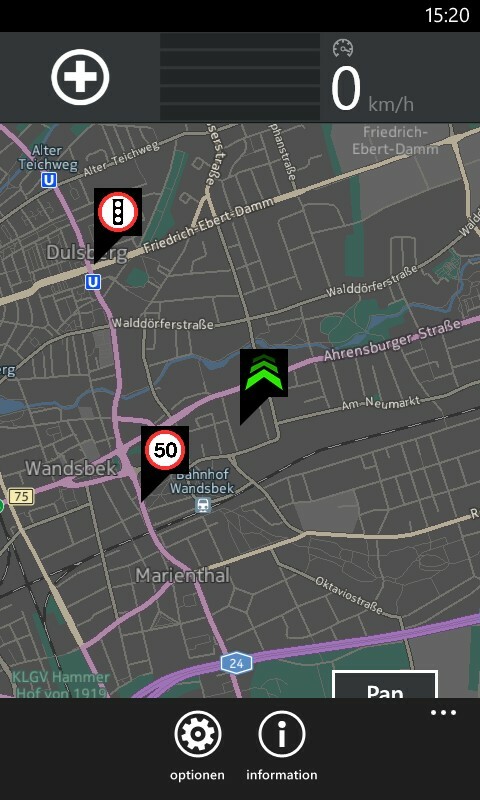 …until 100 meters before the speed camera all the bars have been colourized into red to signalize an extremely alertness. Audible alerts occur 500 meters, 300 meters and 100 meters before a speed camera. It might happen that a presumably nonsensical alert occurs. For example, a traffic light or a 50-kph-speed camera on highway. So please assure that the displayed street name is on the route, actually. 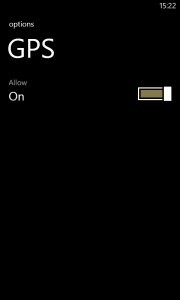 In the settings of the app, the background mode can be set to ‚enable‘. 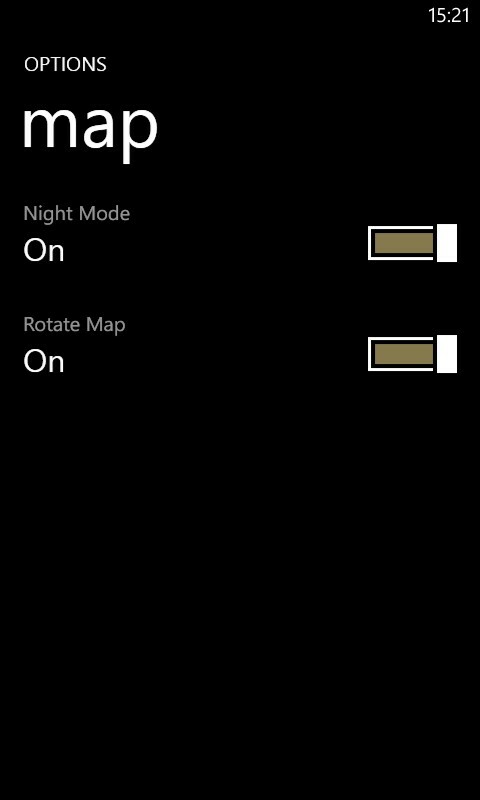 Even if a navigation app is running in the foreground, alerts are given. 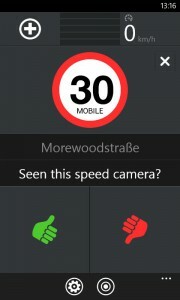 When an alert for a mobile speed camera has been occurred after passing the speed camera a query screen appears, whether it was seen (thumb up) or not (thumb down). The respond is simply by tapping one of the buttons. If in doubt, please close the window without tapping the buttons. 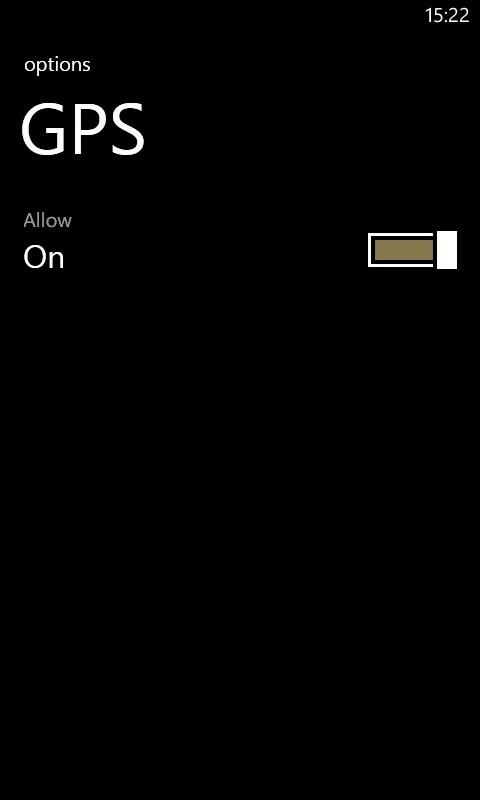 This screen is displayed for about 20 seconds and disappears if no button has been tapped. Besides the speed camera confirmation unknown speed cameras can get reported. 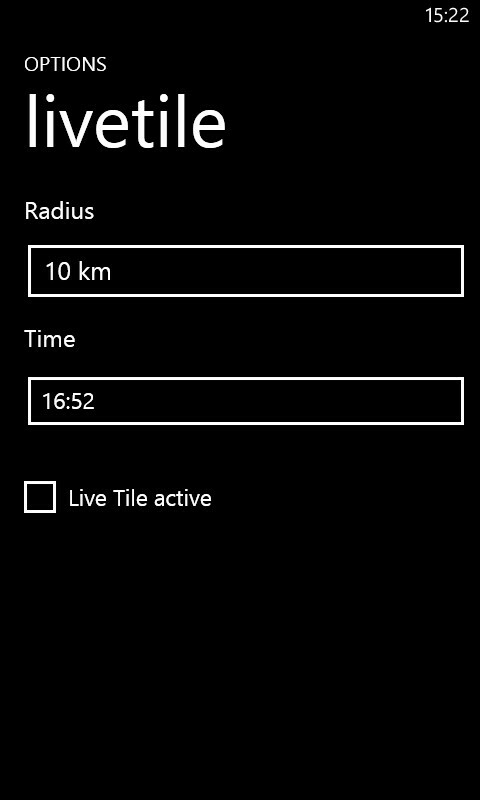 This is simply by tapping on the “+”-button in the upper left corner of the start screen. 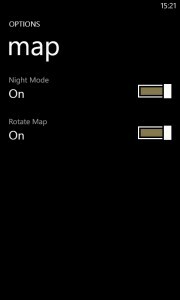 The app memorise the GPS position where the button is tapped and will display a confirmation popup. Important for the reporting is the selection what kind of a speed camera it is. 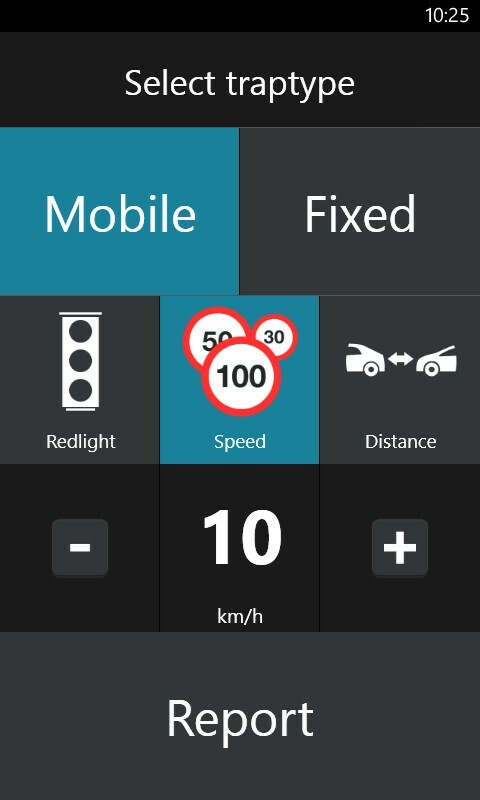 Besides different speeds, distance and traffic light supervision as well can be chosen and get reported. Both mobile and fixed cameras can get reported. 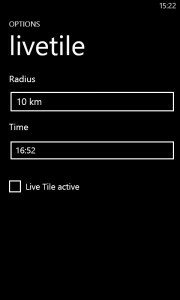 The selected speed camera type for reporting is marked as a blue tile. 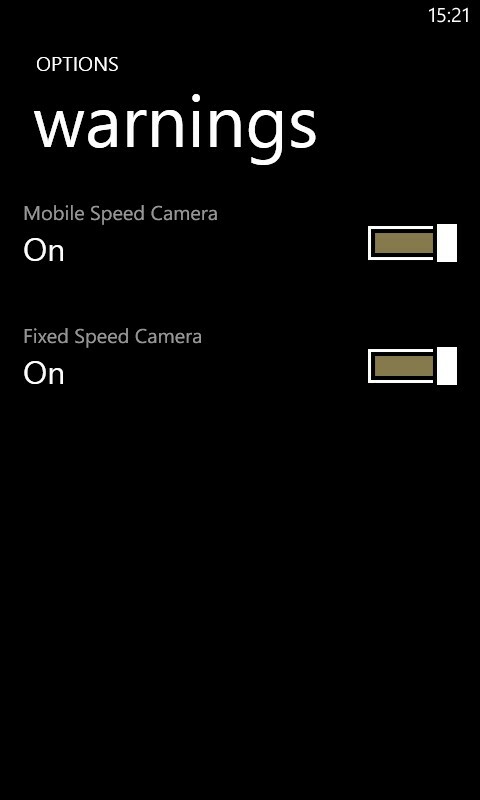 The preselected camera type is mobile speed camera, because this happens most frequently. 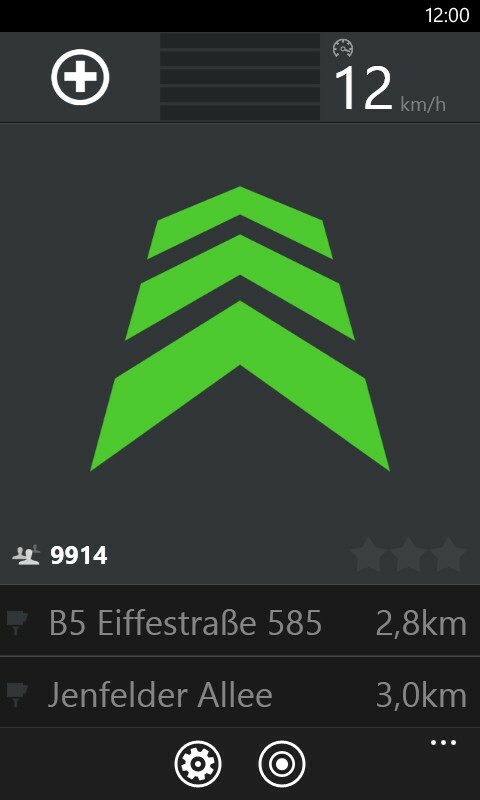 The default speed is set according to the current speed by tapping the „+“-button. 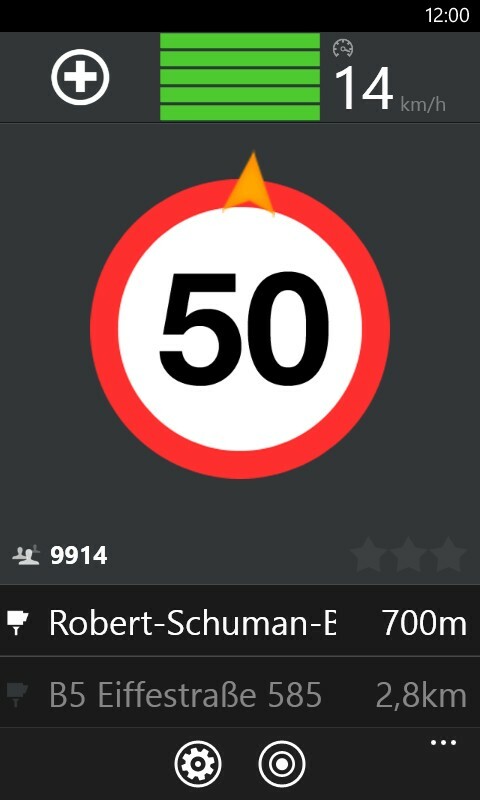 This speed shall be rounded up to the nearest ten. That means when the driven speed is 41 kph, 50 kph is set, as it is at 49 kph. 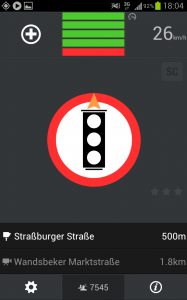 If 50 kph is driven, it remains at 50 kph default. After the report a confirmation popup appears that if the report is sent or not. 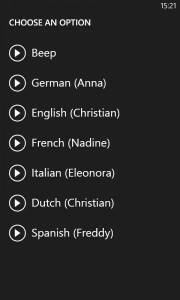 In this section, the language can be selected in which the displayed and the audible alerts should be given. 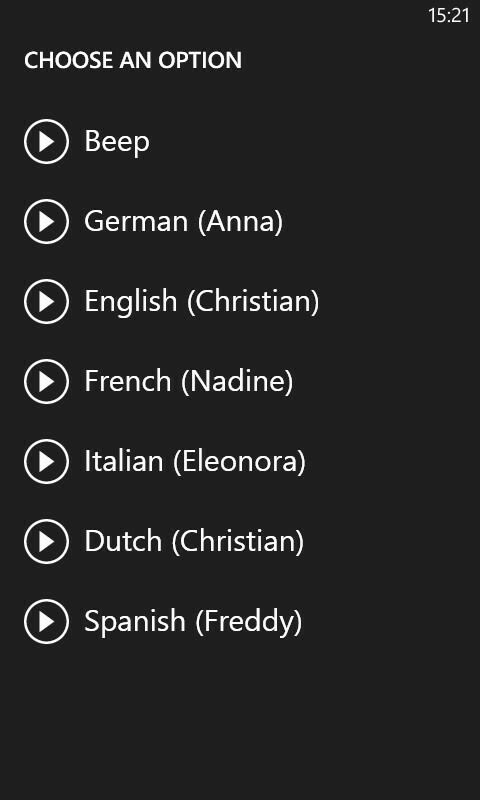 You can choose one of English, German, Dutch, Italian, Spanish and French. 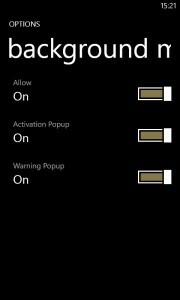 In this menu item the volume of the alerts can be adjusted. 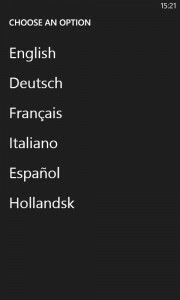 This setting might get tested, also. 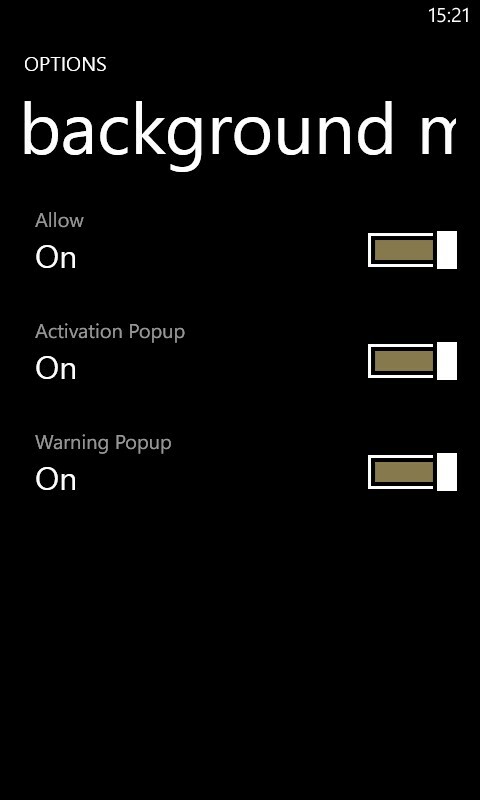 Furthermore it’s to select whether alerts shall be given out as in different voices or as beeps. If data roaming should be enabled this can be disable separately for this application. Please note that no updates for speed camera database will occur in off-line mode. The last loaded fixed speed cameras and mobile speed cameras remain available. There can be selected either warnings shall be given for fixed and /or mobile speed cameras. At least one option must be enabled. 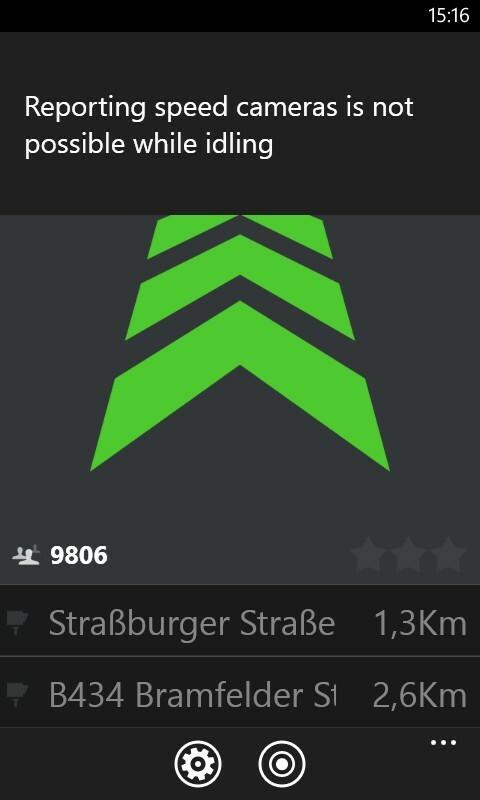 This window appears with a tap on the little „i“ at the bottom right of the app. 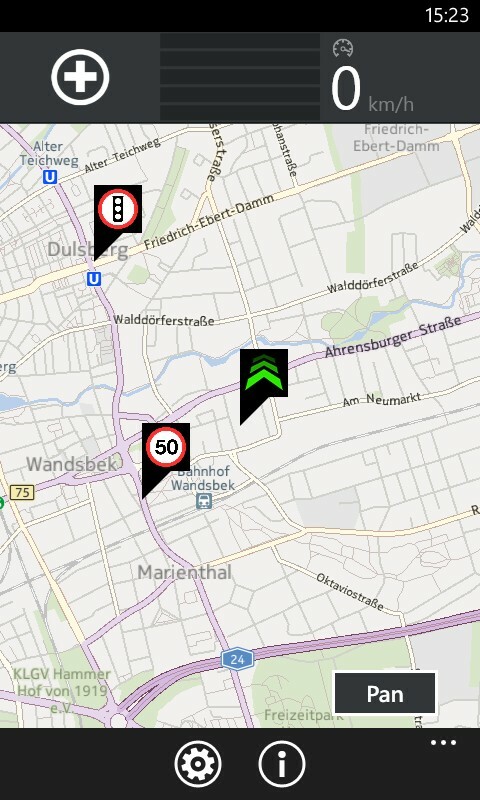 This screen displays the number of speed cameras in your database and in an area of 50 km diameter. The number of speed cameras in area of 50 km is rather informative. 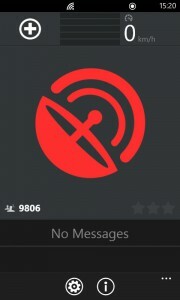 By re-tapping on the icon bottom right the app returns to radar view. If a speed camera comes closer the warning bars were displayed on the top of the screen.